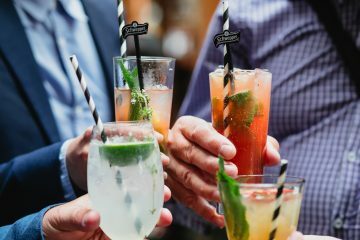 The Melbourne Cup Carnival begins in earnest this Saturday with Derby Day, a day that marks a week long carnival of racing, fashion, food and fun! The Birdcage at Flemington is home to a number of marquees that will host special guests, VIPs and celebrities over the course of the carnival, and we managed to get the low down on what’s happening in them. To mark Emirates’ milestone of 20 years of operation in Australia, Emirates has aptly announced Australia as the theme of its highly anticipated Birdcage marquee at this year’s Melbourne Cup Carnival. Emirates will welcome guests through the doors of its classic Australian homestead inspired marquee, taking inspiration from its local destinations – Perth, Brisbane, Melbourne, Adelaide and Sydney – into an interior filled with vibrant flora and fauna including eucalyptus mint, waratahs and kangaroo paws – a true nod to our diverse countryside. Racegoers will also be able to enjoy unsurpassed views of the Flemington racetrack for the race that stops a nationTM, on a sweeping veranda that will extend the length of the marquee, and be adorned with rainforest ferns and palms found in Victoria’s Otway ranges. The Emirates marquee will once again host the Birdcage’s only fully serviced, sit-down restaurant offering guests a unique dining experience with a tasting plate of five locally produced dishes inspired by the five Emirates destinations that has been developed by Wolgan Valley One&Only, Executive Chef Nancy Kinchella, who earned a Michelin star during her time in London. The marquee will also feature a pampering lounge, The Parlour, where Lancome and Joey Scandizzo Salon will be helping racegoers with touch ups and hair styling. Acclaimed Australian artist David Bromley is the Creative Director of the Wolf Blass Birdcage marquee for the second year running. Aptly themed ‘Inside the artist’s studio’, the marquee will bring to life another collaboration Wolf Blass wines and Bromley have been working on this year – a stunning new wine series called Bromley by Wolf Blass. The wine series will feature some of Bromley’s most recognised works of art on the labels – from his Birds, Nudes and Butterflies series – giving Wolf Blass fans the opportunity to have a little piece of Bromley in their home. Available in fine wine retailers now until sold out, they will soon be considered collectables. Each of the original artworks that feature on the labels will be displayed inside the Wolf Blass marquee during all four main race days. Furnishings include handpicked ornate Victorian era pieces and antiques from Bromley’s own personal collection. Serving as a homage to the Bromley by Wolf Blass collaboration, the exterior of the marquee is also set to impress – a large-scale collage of the wine label artworks meticulously hand-painted by Bromley himself. 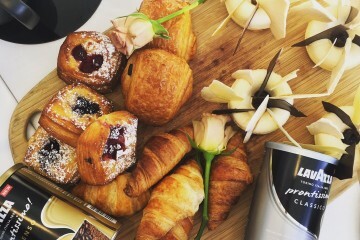 Guests of the Lavazza marquee will get a taste of Milan at this year’s Melbourne Cup Carnival with the Italian coffeehouse launching its marquee theme ahead of the most anticipated spring race days in Melbourne. Vogue Living’s Neale Whitaker is responsible for the creation, which boasts Tom Dixon Plane chandeliers, traditional terracotta flooring and a 360 degree view of Milan’s Galleria, the epicenter of the fashion capital, with the walls and ceiling of the marquee replicating the magnificence of the Italian mid-century building. While Whitaker was responsible for the styling and design of the marquee, renowned Australian chef Adam D’Sylva has created four signature dishes on the Italian menu. Drawing from his Italian heritage, D’Sylva, the owner of popular Melbourne restaurants Coda and Tonka will serve one of the signature Italian dishes on each day of the Melbourne Cup Carnival. Schweppes brings their quality, style and sophistication to The Birdcage with Bar Schweppes, taking race-goers through a multi-sensorial journey that will bring to life the untold stories of the secret Schweppes recipes and the magic of Schweppervescence. Cocktail connoisseurs will experience six of the finest creations inspired by the Schweppes range and prepared by skilled mixologists, with each one drawing out the rich flavours of the exotic ingredients of Schweppes classic mixers. Sleek, polished, navy and gold interiors will encapsulate the spirit of Schweppervescence through an interactive sensory experience that shares the stories of Schweppes’ most iconic flavours, bespoke blends and secret recipes that are known by only a handful of Schweppes Master Blenders. A sculptured wall will celebrate the hero ingredients, whilst a sparkling, kinetic ceiling installation of glistening gold bubbles will flow from the bar throughout the marquee and onto the facade. Hot off the list includes ‘The Hot Favourite’ – mixing a dash of chilli bitters with the kick of fresh chilli, paired with the earthy spice of Schweppes Dry Ginger Ale: a classic mixer which uses a unique blend of two types of ginger, citrus oils and a hint of chilli sourced from India, giving it a distinctive bite. The zesty flavour of the ‘Saintly Spritz’ will have tastebuds dancing, with its combination of fresh citrus oils and spiced falernum, perfectly enhancing the bespoke blend of natural lemon and lime oils combined to make SchweppesLemonade. Bar Schweppes will, of course, be offering crowd favourite and official cocktail of the Melbourne Cup Carnival, the ‘Flemington Fling’ – an intrinsic part of the Carnival experience, made with a delicious mix of vodka, fresh lime, aromatic mint and the fruity flavour of Schweppes Agrum Blood Orange. Sweet scents that reflect the ingredients within Schweppes’ mixers will fill the marquee throughout the day, starting the morning off with fresh lemon and orange peel, used in Schweppes Indian Tonic Water. As the day progresses, an aroma of warm ginger root, citrus oils and a touch of chilli will provide guests with the kick they need in the afternoon, all key ingredients in Schweppes Dry Ginger Ale.